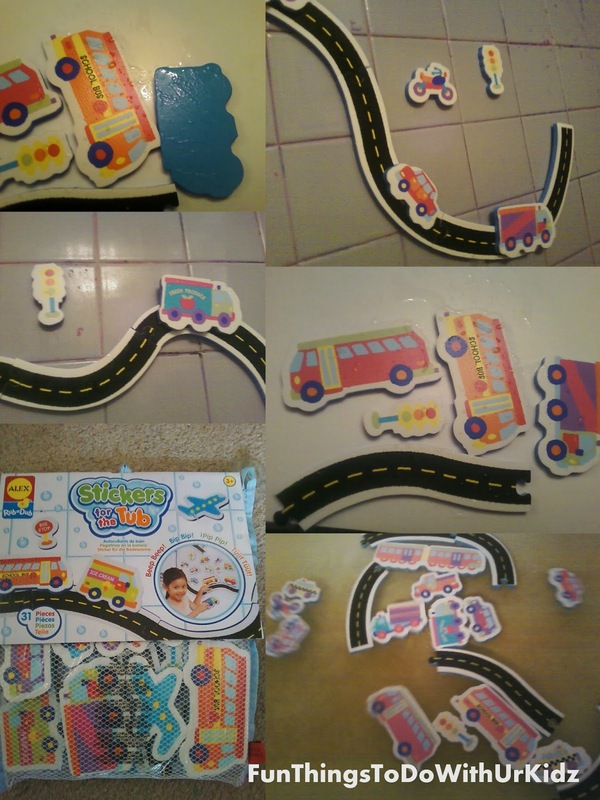 Toy review~ Alex Toys Stickers For The Tub - Beep! Beep! item~ Alex Toys Stickers For The Tub - Beep! Beep! Build a busy roadway in your bath! Comes with 6 sections of interconnecting roadway, cars, trucks, buses, motorcycles, traffic lights, signs and more! 31 pieces. This toy is great for any cars/boat/air plane lover. With a total of 31 pieces our play time went on for little over a hour. Both my kids (ages 4 and 2) loved this toy. You can make different roads and add stop signs and lights. I did not have a problem with it sticking to my bathtub walls or even my window! That means the play time can/did continue after bath time was over. When it was time to clean up it comes with its own drying basket that you can also hang. I highly recommend this toy for any kid/toddler. It does say for ages 3 and up but I have no issues with my 2 year old.